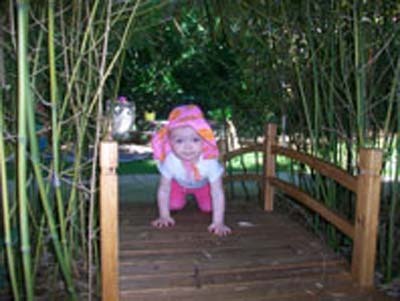 Estes Children’s Cottage is the first certified Nature Explore Classroom in the state of North Carolina. Designed to be an entrance into the program, this lush and inviting space allows families an opportunity to slow down and enjoy the outdoor space each morning when they make the transition from home. Having a space delineated into specific areas has allowed staff to think more intentionally about items they make available to the children and where each type of material is stored. The children now know where to find materials and they are able to act independently in choosing activities and they also know where to put materials away when they end an activity. While observing the students, it was found that using natural barriers, such as grasses and plants, positively influenced the children’s movements outside. 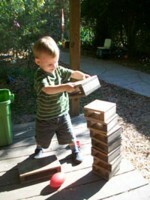 It helped to encourage actions such as keeping materials like sand in the sandbox. Two local high school students helped with the classroom transformation as part of a high school Advanced Placement Environmental Science class. This program involved combining nature and the community and they shared the project with their high school class through a website and photographs. After reading through the Nature Explore Learning With Nature Idea Book and sharing this resource with their class, the two collaborated with Estes Children’s Cottage on names for each of the designated areas. They then collected large, smooth rocks and painted and labeled them with words and pictures. To further their involvement, they also helped the children plant in the garden. 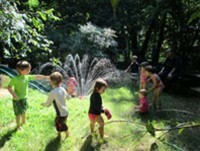 The outdoor classroom provides an abundance of opportunities for imaginative play and learning while the children interact with plants, trees and each other. Throughout the yard, plants flourish in the North Carolina sunshine. Honeysuckle grows over the fence to soften the sharp lines while a row of crepe myrtle trees, a bamboo forest, and a holly bush adds interest to the space. Estes works hard to maintain a covering of grass over most of the yard and new plants are constantly being added. Sticks, pine cones and leaves are left on the ground after falling from the trees so there is always a plethora of loose parts available. Each child who attends the program is asked to leave their hand print on a tile to be displayed on a mosaic art piece surrounding the outside of the chimney. Each year, Estes gives approximately 40 tours to prospective families, visitors, college students and other educators interested in their program. 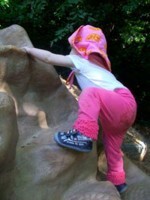 Photos of outdoor classroom activities are shared with families on the website and through newsletters. Families are also encouraged to spend time with their children exploring the classroom and taking part in activities and trips.